At the 2016 Game Developer's Conference, Sony announced that the PlayStation VR, a fully capable virtual reality headset for the PS4, will be releasing in October of 2016 for $399 USD. Been a long time waiting for this, and to be honest, I have mixed feelings. For starters, I think the price, while high, is still $200 less than the Oclulus Rift and $400 less than the HTC Vive. Even so, this is an exciting time to be a gamer, so let's take a look at all the exciting new details on what could be the future of gaming. 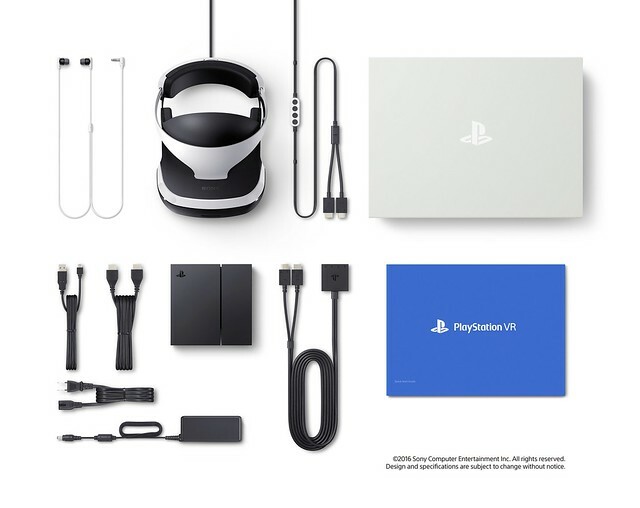 PlayStation VR: What's in The Box? Andrew House posted on the PlayStation Blog with all the news from GDC. He provided an image of what would be included in the box, but didn't provide a list of the actual items. But Bradley, I hear your crying, what about the PlayStation Camera? What about the Move controllers I heard you'll need? A Sony representative told journalists at The Verge that the camera is not included because so many people already own it. I have one, but I really wonder how many people bought the camera since launch? They haven't exactly supported it. As far as the Move controllers go, they're cheap and you probably won't need them for every game. Further more, according to Techinsider, another Sony representative did confirm that Sony had plans to release a bundle with the VR headset, Move controller, and camera, but no price was mentioned. The PlayStation VR specs we've heard about in recent months seem to have held up for the consumer release. It will display your games on a 5.7-inch OLED screen up to 120 frames per second at 1920 x RGB x 1080. There are nine LEDs on the device for 360-degree head tracking and Sony is boasting a latency of less then 18ms. The look of the final headset is similar to what we've come to expect. It has a strap that hold the black and white headset to your face, which is similar to how the device looked when it was first announced. Sony confirmed that there would be a free version of the Playroom app for PlayStation VR at launch that includes several mini-games showcasing the power of the headset's capabilities. In addition, a whopping 50 games are slated for release between the October launch and the end of the year. We've got a full list of the games currently announced for PlayStation VR as well. Sony also revealed a Star Wars: Battlefront VR experience exclusive to PlayStation VR as the GDC press conference. Palmer Luckey, founder and creator of the Oculus Rift headset, spoke with GameSpot at the GDC conference. "I know how much this technology costs. We're building a headset, we're trying to sell it as affordably as possible. We have some higher quality stuff, our manufactured stuff, and we have some really nice soft goods and fabric going on in ours. We also have multiple LED displays instead of just one display. But [the Oculus Rift] at $599 is actually not that far off. We're selling $599 with a controller, and with the remote, and with a couple of games. If someone doesn't own them already, [Sony] is selling a camera, a controller, and you've got the headset—we’re actually fairly similar in cost. They are cheaper, but I think it's a totally fair price and they've definitely done a good job of keeping the cost down. Clearly that was a priority." Yeah, okay, but it costs $299 for a PS4 and about $1,500 for a PC that can play Oculus Rift games. Just saying. Luckey went on to say that these headsets are for different markets. He argues that PS VR is for people who already have a PS4, and his headset is for people who have or are willing to pay for a high-end PC in the interest of VR. Are you picking up PlayStation VR? If so, what games are you excited for and more importantly, do you already own the camera? Let us know! This is some really good news, can't wait to try these soon. One little thing, at the start of the article the PS VR is priced @ $399 but at the end it's mentioned @ $299 for the VR. Is there something i missed? I double-checked the article and I didn't see a place where the VR was priced for $299. There was a sentence toward the end where I was talking about the price of the PS4 console being $299 when compared to a $1500 PC for the Oculus Rift, could that be where the confusion came from? Let me know if I missed it and I'll be sure to fix the error. PlayStation VR is going to be $399 though for sure. Thanks for reading!